Copyright © 2004 W3C® (MIT, ERCIM, Keio), All Rights Reserved. W3C liability, trademark, document use rules apply. The Web Services Choreography Description Language (WS-CDL) is an XML-based language that describes peer-to-peer collaborations of parties by defining, from a global viewpoint, their common and complementary observable behavior; where ordered message exchanges result in accomplishing a common business goal. The Web Services specifications offer a communication bridge between the heterogeneous computational environments used to develop and host applications. The future of E-Business applications requires the ability to perform long-lived, peer-to-peer collaborations between the participating services, within or across the trusted domains of an organization. The Web Services Choreography specification is targeted for composing interoperable, peer-to-peer collaborations between any type of party regardless of the supporting platform or programming model used by the implementation of the hosting environment. This is the second published Working Draft of the Web Services Choreography Description Language document. It should be the last version before Last Call WD. It has been produced by the Web Services Choreography Working Group, which is part of the Web Services Activity. This document is a chartered deliverable of the Web Services Choreography Working Group. Some issues are already identified and in the process of being fixed before going to Last Call, see the group's issue section. This document is based upon the Working Draft published on 27 April 2004. Changes between these two versions are described in a diff document. Comments on this document should be sent to public-ws-chor-comments@w3.org (public archive). It is inappropriate to send discussion emails to this address. Discussion of this document takes place on the public public-ws-chor@w3.org mailing list (public archive) per the email communication rules in the Web Services Choreography Working Group charter. This document has been produced under the 24 January 2002 CPP as amended by the W3C Patent Policy Transition Procedure. An individual who has actual knowledge of a patent which the individual believes contains Essential Claim(s) with respect to this specification should disclose the information in accordance with section 6 of the W3C Patent Policy. Patent disclosures relevant to this specification may be found on the Working Group's patent disclosure page. For many years, organizations have being developing solutions for automating their peer-to-peer collaborations, within or across their trusted domain, in an effort to improve productivity and reduce operating costs. The past few years have seen the Extensible Markup Language (XML) and the Web Services framework developing as the de-facto choices for describing interoperable data and platform neutral business interfaces, enabling more open business transactions to be developed. Web Services are a key component of the emerging, loosely coupled, Web-based computing architecture. A Web Service is an autonomous, standards-based component whose public interfaces are defined and described using XML. Other systems may interact with a Web Service in a manner prescribed by its definition, using XML based messages conveyed by Internet protocols. The keywords "MUST", "MUST NOT", "REQUIRED", "SHALL", "SHALL NOT", "SHOULD", "SHOULD NOT", "RECOMMENDED", "MAY", and "OPTIONAL" in this document are to be interpreted as described in RFC-2119 . wsdl http://www.w3.org/2004/08/wsdl WSDL namespace for WSDL framework. cdl http://www.w3.org/2004/10/ws-chor/cdl WSCDL namespace for Choreography language. xsi http://www.w3.org/2001/XMLSchema-instance Instance namespace as defined by XSD . xsd http://www.w3.org/2001/XMLSchema Schema namespace as defined by XSD . tns (various) The "this namespace" (tns) prefix is used as a convention to refer to the current document. (other) (various) All other namespace prefixes are samples only. In particular, URIs starting with "http://example.com" represent some application-dependent or context-dependent URIs . The syntax appears as an XML instance, but the values indicate the data types instead of values. Characters are appended to elements and attributes as follows: "?" (0 or 1), "*" (0 or more), "+" (1 or more). Elements names ending in "" (such as <element/> or <element>) indicate that elements/attributes irrelevant to the context are being omitted. Grammar in bold has not been introduced earlier in the document, or is of particular interest in an example. <-- extensibility element --> is a placeholder for elements from some "other" namespace (like ##other in XSD). The XML namespace prefixes (defined above) are used to indicate the namespace of the element being defined. Examples starting with <?xml contain enough information to conform to this specification; others examples are fragments and require additional information to be specified in order to conform. XSD schemas are provided as a formal definition of WS-CDL grammar (see Section 9). Business or other activities that involve multiple different organizations or independent processes are engaged in a collaborative fashion to achieve a common business goal, such as Order Fulfillment. For the collaboration to work successfully, the rules of engagement between all the interacting parties must be provided. Whereas today these rules are frequently written in English, a standardized way for precisely defining these interactions, leaving unambiguous documentation of the parties and responsibilities of each, is missing. The Web Services Choreography specification is targeted for precisely describing peer-to-peer collaborations between any type of party regardless of the supporting platform or programming model used by the implementation of the hosting environment. Using the Web Services Choreography specification, a contract containing a "global" definition of the common ordering conditions and constraints under which messages are exchanged is produced that describes from a global viewpoint the common and complementary observable behavior of all the parties involved. Each party can then use the global definition to build and test solutions that conform to it. The main advantage of a contract with a global definition approach is that it separates the process being followed by an individual business or system within a "domain of control" from the definition of the sequence in which each business or system exchanges information with others. This means that, as long as the "observable" sequence does not change, the rules and logic followed within the domain of control can change at will. In real-world scenarios, corporate entities are often unwilling to delegate control of their business processes to their integration partners. Choreography offers a means by which the rules of participation within a collaboration can be clearly defined and agreed to, jointly. Each entity may then implement its portion of the Choreography as determined by the common view. The figure below demonstrates a possible usage of the Choreography Language. Similarly, a Choreography can specify the interoperability and interactions between services within one business entity. The primary goal of a Choreography Language is to specify a declarative, XML based language that defines from a global viewpoint the common and complementary observable behavior, where message exchanges occur, and when the jointly agreed ordering rules are satisfied. Specification Composability. This specification will work alongside and complement other specifications such as the WS-Reliability , WS-Composite Application Framework (WS-CAF) , WS-Security , Business Process Execution Language for WS (WS-BPEL) , etc. This specification depends on the following specifications: XML 1.0 , XML-Namespaces , XML-Schema 1.0 [11, 12] and XPath 1.0 . In addition, support for including and referencing service definitions given in WSDL 2.0  is a normative part of this specification. A Choreography Language is not an "executable business process description language" [16, 17, 18, 19, 20] or an implementation language . The role of specifying the execution logic of an application will be covered by these specifications. 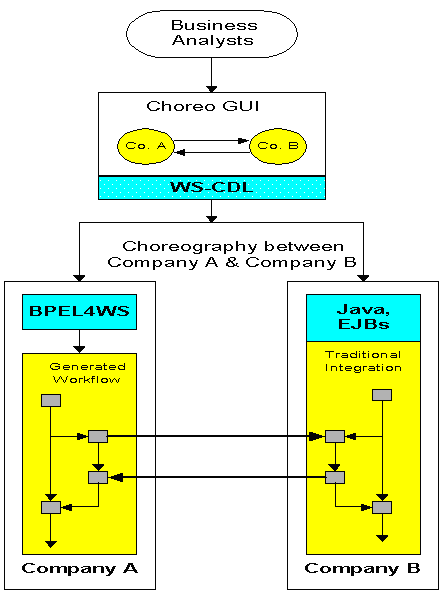 This section introduces the Web Services Choreography Description Language (WS-CDL) model. WS-CDL describes interoperable, peer-to-peer collaborations between parties. In order to facilitate these collaborations, services commit on mutual responsibilities by establishing Relationships. Their collaboration takes place in a jointly agreed set of ordering and constraint rules, whereby messages are exchanged between the parties. A WS-CDL document is simply a set of definitions. Each definition is a named construct that can be referenced. There is a package element at the root, and the individual Choreography type definitions inside. A WS-CDL Choreography Package aggregates a set of Choreography type definitions, provides a namespace for the definitions and through the use of XInclude , syntactically includes Choreography type definitions that are defined in other Choreography Packages. The top-level attributes name, author, and version define authoring properties of the Choreography document. The targetNamespace attribute provides the namespace associated with all definitions contained in this Package. Choreography definitions included to this Package using the inclusion mechanism, may be associated with other namespaces. The elements informationType, token, tokenLocator, roleType, relationshipType, participantType and channelType are shared by all the Choreographies defined within this Package. Within a WS-CDL Package, language constructs that need to be uniquely named MUST use the attribute name for specifying a distinct name. WS-CDL documents MUST be assigned a name attribute of type NCNAME that serves as a lightweight form of documentation. The targetNamespace attribute of type URI MUST be specified. The URI MUST NOT be a relative URI. A reference to a definition is made using a QName. Each definition type has its own name scope. Names within a name scope MUST be unique within a WS-CDL document. The resolution of QNames in WS-CDL is similar to the resolution of QNames described by the XML Schemas specification . To support extending the WS-CDL language, this specification allows the use of extensibility elements and/or attributes defined in other XML namespaces. Extensibility elements and/or attributes MUST use an XML namespace different from that of WS-CDL. All extension namespaces used in a WS-CDL document MUST be declared. Extensions MUST NOT change the semantics of any element or attribute from the WS-CDL namespace. Within a WS-CDL document, descriptions will be required to allow the recording of semantics definitions. The optional description sub-element is used as a textual description for documentation purposes. This element is allowed inside any WS-CDL language element. Descriptions that are text or document references can be defined in multiple different human readable languages. The WSDL specification  describes the functionality of a service provided by a party based on a stateless, client-server model. The emerging Web Based applications require the ability to exchange messages in a peer-to-peer environment. In these types of environments a party represents a requester of services provided by another party and is at the same time a provider of services requested from other parties, thus creating mutual multi-party service dependencies. A WS-CDL document describes how a party is capable of engaging in peer-to-peer collaborations with the same party or with different parties. The Role Types, Participant Types, Relationship Types and Channel Types define the coupling of the collaborating parties. A Role Type enumerates the observable behavior a party exhibits in order to collaborate with other parties. For example the Buyer Role Type is associated with purchasing of goods or services and the Supplier Role Type is associated with providing those goods or services for a fee. The attribute name is used for specifying a distinct name for each roleType element declared within a Choreography Package. Within the roleType element, the behavior element specifies a subset of the observable behavior a party exhibits. A Role Type MUST contain one or more behavior elements. The behavior element defines an optional interface attribute, which identifies a WSDL interface type. A behavior without an interface describes a Role Type that is not required to support a specific Web Service interface. A Participant Type identifies a set of Role Types that MUST be implemented by the same entity or organization. Its purpose is to group together the parts of the observable behavior that MUST be implemented by the same process. The attribute name is used for specifying a distinct name for each participantType element declared within a Choreography Package. The attribute name is used for specifying a distinct name for each relationshipType element declared within a Choreography Package. A relationshipType element MUST have exactly two Role Types defined. Within the role element, the optional attribute behavior identifies the commitment of a party as a list of behavior types belonging to the Role Type specified by the type attribute of the role element. If the behavior attribute is missing then all the behaviors belonging to the Role Type specified by the type attribute of the role element are identified as the commitment of a party. A Channel realizes a point of collaboration between parties by specifying where and how information is exchanged. Additionally, Channel information can be passed among parties. This allows the modeling of both static and dynamic message destinations when collaborating within a Choreography. For example, a Buyer could specify Channel information to be used for sending delivery information. The Buyer could then send the Channel information to the Seller who then forwards it to the Shipper. The Shipper could then send delivery information directly to the Buyer using the Channel information originally supplied by the Buyer. A Channel Type MUST describe the Role Type and the reference type of a party, being the target of an Interaction, which is then used for determining where and how to send/receive information to/into the party. A Channel Type MAY specify the instance identity of an entity implementing the behavior(s) of a party, being the target of an Interaction. A Channel Type MAY describe one or more logical conversations between parties, where each conversation groups a set of related message exchanges. One or more Channel(s) MAY be passed around from one Role to another. A Channel Type MAY restrict the Channel Type(s) allowed to be exchanged between the parties, through a Channel of this Channel Type. Additionally, a Channel Type MAY restrict the number of times a Channel of this Channel Type is used. The attribute name is used for specifying a distinct name for each channelType element declared within a Choreography Package. The optional attribute usage is used to restrict the number of times a Channel can be used. The optional element passing describes the Channel Type(s) that are exchanged from one Role Type to another Role Type, when using a Channel of this Channel Type in an Interaction. In the case where the operation used to exchange the Channel is of request-response type, then the attribute action within the passing element defines if the Channel will be exchanged during the request or during the response. The Channels exchanged MAY be used in subsequent Interaction activities. If the element passing is missing then this Channel Type MAY be used for exchanging business documents and all Channel Types without any restrictions. The element role is used to identify the Role Type of a party, being the target of an Interaction, which is then used for statically determining where and how to send or receive information to or into the party. The element reference is used for describing the reference type of a party, being the target of an Interaction, which is then used for dynamically determining where and how to send or receive information to or into the party. The service reference of a party is distinguished by a Token as specified by the token element within the reference element. The optional element identity MAY be used for identifying an instance of an entity implementing the behavior of a party and for identifying a logical conversation between parties. The process identity and the different conversations are distinguished by a set of Tokens as specified by the token element within the identity element. Parties make progress within a collaboration, when recordings of exchanged information and observable information changes cause ordering constraints to be fulfilled. A WS-CDL document allows defining information within a Choreography that can influence the behavior of the collaborating parties. Variables capture information about objects in the Choreography, such as the messages exchanged or the observables information of the Roles involved. Token are aliases that can be used to reference parts of a Variable. Both Variables and Tokens have Information Types that define the type of information the Variable or Token contain. Information types describe the type of information used within a Choreography. By introducing this abstraction, a Choreography definition avoids referencing directly the data types, as defined within a WSDL document or an XML Schema document. The attribute name is used for specifying a distinct name for each informationType element declared within a Choreography Package. The attributes type, and element describe the document to be an XML Schema type, or an XML Schema element respectively. The document is of one of these types exclusively. Channel Capturing Variables. For example, a Channel Variable could contain information such as the URL to which the message could be sent, the policies that are to be applied, such as security, whether or not reliable messaging is to be used, etc. The variableDefinitions construct is used for defining one or more Variables within a Choreography block. The optional attribute mutable, when set to "false" describes that the Variable information when initialized, cannot change anymore. The default value for this attribute is "true". The optional attribute free, when set to "false" describes that a Variable is defined in this Choreography. The default value for the free attribute is "false". The optional attribute silentAction, when set to "true" describes that there SHOULD NOT be any activity used for creating or changing this Variable in the Choreography, if these operations should not be observable to other parties. The default value for this attribute is "false". The optional attribute roleType is used to specify the Role Type of a party at which the Variable information will reside. Expressions are used within WS-CDL to obtain existing information and to create new or change existing information. Predicate expressions are used within WS-CDL to specify conditions. Query expressions are used within WS-CDL to specify query strings. The language used in WS-CDL for specifying expressions and query or conditional predicates is XPath 1.0. WS-CDL defines XPath function extensions as described in Section 10. The function extensions are defined in the standard WS-CDL namespace "http://www.w3.org/2004/10/ws-chor/cdl". The prefix "cdl:" is associated with this namespace. A Token is an alias for a piece of data in a Variable or message that needs to be used by a Choreography. Tokens differ from Variables in that Variables contain values whereas Tokens contain information that defines the piece of the data that is relevant. For example a Token for "Order Amount" within an Order XML document could be an alias for an expression that pointed to the Order Amount element within the Order XML document. This could then be used as part of a condition that controls the ordering of a Choreography, for example "Order Amount > $1000". All Tokens MUST have an informationType, for example, an "Order Amount" would be of type "amount", "Order Id" could be alphanumeric and a counter an integer. Tokens types reference a document fragment within a Choreography definition and Token Locators provide a query mechanism to select them. By introducing these abstractions, a Choreography definition avoids depending on specific message types, as described by WSDL, or a specific query string, as specified by XPATH, but instead the the query string can change without affecting the Choreography definition. The attribute name is used for specifying a distinct name for each token element declared within a Choreography Package. The attribute informationType identifies the type of the document fragment. The attribute tokenName identifies the name of the Token that the document fragment locator is associated with. The attribute informationType identifies the type on which the query is performed to locate the Token. The attribute query defines the query string that is used to select a document fragment within a document.
. The operational semantics of these rules are based on the information-driven computational model, where availability of variable information causes a guarded unit-of-work and its enclosed actions to be enabled. A Choreography defined at the Package level is called a top-level Choreography, and does not share its context with other top-level Choreographies. A Package MAY contain exactly one top-level Choreography, marked explicitly as the root Choreography. A Choreography defines the re-usable the common rules, that govern the ordering of exhanged messages and the provisioning patterns of behavior, as the action(s) performing the actual work, such as exchange of messages, when the specified ordering constraints are satisfied. The re-usable behavior encapsulated within a Choreography MAY be performed within an enclosing Choreography, thus facilitating recursive composition. The performed Choreography is then called an enclosed Choreography. A Choreography MUST contain at least one Relationship Type, enumerating the observable behavior this Choreography requires its parties to exhibit. One or more Relationship Types MAY be defined within a Choreography, modeling multi-party collaborations. A Choreography acts as a lexical name scoping context for Variables. A Variable defined in a Choreography is visible for use in this Choreography and all its enclosed Choreographies up-to the point that the Variable is re-defined as an non-free Variable, thus forming a Choreography Visibility Horizon for this Variable. A Choreography MAY contain one or more Choreography definitions that MAY be performed only locally within this Choreography. A Choreography MUST contain an Activity-Notation. The Activity-Notation specifies the enclosed actions of the Choreography that perform the actual work. The attribute name is used for specifying a distinct name for each choreography element declared within a Choreography Package. The optional complete attribute allows to explicitly complete a Choreography as described below in the Choreography Life-line section. The relationship element within the choreography element enumerates the Relationships this Choreography MAY participate in. The optional variableDefinitions element enumerates the Variables defined in this Choreography. The optional root element marks a top-level Choreography as the root Choreography of a Choreography Package. The optional Choreography-Notation within the choreography element defines the Choreographies that MAY be performed only within this Choreography. The optional exception element defines the Exception block of a Choreography by specifying one or more Exception Work Unit(s). The optional finalizer element defines the Finalizer block of a Choreography by specifying one Finalizer Work Unit. A Work Unit MAY prescribe the constraints that preserve the consistency of the collaborations commonly performed between the parties. Using a Work Unit an application MAY recover from faults that are the result of abnormal actions and also MAY finalize completed actions that need to be logically rolled back. When enabled, a Work Unit expresses interest(s) on the availability of one or more Variable information that already exist or will be created in the future. The Work Unit's interest(s) are matched when all the required Variable information are or become available and the specified matching condition on the Variable information is met. Availability of some Variable information does not mean that a Work Unit matches immediately. Only when all Variable information required by a Work Unit become available, in the appropriate Visibility Horizon, does matching succeed. Variable information available within a Choreography MAY be matched with a Work Unit that will be enabled in the future. One or more Work Units MAY be matched concurrently if their respective interests are matched. When a Work Unit matching succeeds then its enclosed actions are enabled. A Work Unit MUST contain an Activity-Notation that performs the actual work. A Work Unit completes successfully when all its enclosed actions complete successfully. A Work Unit that completes successfully MUST be considered again for matching (based on its guard condition), if its repetition condition evaluates to "true". The Activity-Notation specifies the enclosed actions of a Work Unit. The guard condition of a Work Unit, specified by the optional guard attribute, describes the interest on the availability of one or more, existing or future Variable information. The optional repeat attribute allows, when the condition it specifies evaluates to "true", to make the current Work Unit considered again for matching (based on the guard attribute). The optional attribute block specifies whether the matching condition relies on the Variable that is currently available, or whether the Work Unit has to block waiting for the Variable to become available in the future if it is not currently available. The default is set to "false". One or more Variables can be specified in a guard condition or repetition condition, using XPATH and the WS-CDL functions, as described in Section 10. When the WS-CDL function variablesAligned() is used in the guard or repetition condition, it means that the Work Unit that specifies the guard or repetition condition is checking or waiting for an appropriate alignment Interaction to happen between the two Roles, based on the block attribute being "false" or "true" respectively. When the variablesAligned() WS-CDL function is used in a guard or repetition condition, then the Relationship Type within the variablesAligned() MUST be the subset of the Relationship Type that the immediate enclosing Choreography defines. .c. Example of a Work Unit waiting for alignment to happen..
Choreographies or fragments of Choreographies can be syntactically reused in any Choreography definition by using XInclude . The assembly of large Choreography definitions from multiple smaller, well formed Choreographies or Choreography fragments is enabled using this mechanism. A Choreography life-line expresses the progression of a collaboration. Initially, the collaboration MUST be started, then work MAY be performed within it and finally it MAY complete. These different phases are designated by explicitly marked actions within the Choreography. The root Choreography is the only top-level Choreography that MAY be initiated. The root Choreography is enabled when it is initiated. All non-root, top-level Choreographies MAY be enabled when performed. A root Choreography is initiated when the first Interaction, marked as the Choreography initiator, is performed. Two or more Interactions MAY be marked as initiators, indicating alternative initiation actions. In this case, the first action will initiate the Choreography and the other actions will enlist with the already initiated Choreography. An Interaction designated as a Choreography initiator MUST be the first action performed in a Choreography. If a Choreography has two or more Work Units with Interactions marked as initiators, then these are mutually exclusive and the Choreography will be initiated when the first Interaction occurs and the remaining Work Units will be disabled. All the Interactions not marked as initiators indicate that they will enlist with an already initiated Choreography. A Choreography completes successfully when there are no more matched Work Unit(s) performing work within it and there are no enabled Work Unit(s) within it. Alternatively, a Choreography completes successfully if its complete condition, defined by the optional complete attribute within the choreography element, evaluates to "true" there MUST NOT be any matched Work Unit(s) performing work within it but there MAY be one or more Work Units still enabled but not matched yet. One or more Exception WorkUnit(s) MAY be defined as part of a Choreography to recover from exceptional conditions that can occur in that Choreography. A Finalizer WorkUnit MAY be defined as part of a Choreography to provide the finalization actions that semantically "undo" that completed Choreography. A Choreography can sometimes fail as a result of an exceptional circumstance or error. To handle these and other "errors" separate Exception Work Units MAY be defined in the Exception Block of a Choreography, for each "exception" condition that needs to be handled. At least one Exception Work Unit MUST be defined as part of the Exception block of a Choreography for the purpose of handling the exceptional conditions occurring on that Choreography. To handle these, an Exception Work Unit MAY express interest on fault information using its guard condition. If no guard condition is specified, then the default Exception Work Unit expresses interest on any type of fault. Within the Exception Block of a Choreography there MUST NOT be more than one Exception Work Units without guard condition defined. An Exception Work Unit MUST set its attribute block always to "false" and MUST NOT define a repetition condition. Exception Work Units are enabled when the Choregraphy they belong to is enabled. An Exception Work Unit MAY be enabled only once. Exception Work Units enabled in a Choreography MAY behave as the default mechanism to recover from faults for all its enclosed Choreographies. Within the Exception Block of a Choreography only one Exception Work Unit MAY be matched. If a fault is matched by the guard condition of an Exception Work Unit, then the actions of the matched Work Unit are enabled for recovering from the fault. When two or more Exception Work Units are defined then the order of evaluating their guard conditions is based on the order that the Work Units have being defined within the Exception Block. If a fault occurs within a Choreography, then the faulted Choreography completes unsuccessfully and this causes its Finalizer WorkUnit to disabled. The actions, including enclosed Choreographies, enabled within the faulted Choreography are completed abnormally before an Exception Work Unit can be matched. The actions within the Exception Work Unit MAY use Variable information visible in the Visibility Horizon of the Choreography it belongs to as they stand at the current time. The actions of an Exception Work Unit MAY also cause fault. The semantics for matching the fault and acting on it are the same as described in this section. When a Choreography encounters an exceptional condition it MAY need to revert the actions it had already completed, by providing finalization actions that semantically rollback the effects of the completed actions. To handle these a separate Finalizer Work Unit is defined in the Finalizer Block of a Choreography. A Choreography MAY define one Finalizer Work Unit. A Finalizer WorkUnit is enabled only after the Choreography it belongs to completes successfully. The Finalizer Work Unit may be enabled only once. The actions within the Finalizer Work Unit MAY use Variable information visible in the Visibility Horizon of the Choreography it belongs to as they were at the time the Choreography completed or as they stand at the current time. The actions of the Finalizer Work Unit MAY fault. The semantics for matching the fault and acting on it are the same as described in the previous section. Activities are the lowest level components of the Choreography, used to describe the actual work performed when the specified ordering constraints are satisfied. The sequence ordering structure contains one or more Activity-Notations. When the sequence activity is enabled, the sequence element restricts the series of enclosed Activity-Notations to be enabled sequentially, in the same order that they are defined. The parallel ordering structure contains one or more Activity-Notations that are enabled concurrently when the parallel activity is enabled. The choice ordering structure enables a Work Unit to define that only one of two or more Activity-Notations SHOULD be performed. When two or more activities are specified in a choice element, only one activity is selected and the other activities are disabled. If the choice has Work Units with guard conditions, the first Work Unit that matches the guard condition is selected and the other Work Units are disabled. If the choice has other activities, it is assumed that the selection criteria for the activities are non-observable. An Interaction is the basic building block of a Choreography, which results in the exchange of information between parties and possibly the synchronization of their observable information changes and the values of the exchanged information. An Interaction forms the base atom of the recursive Choreography composition, where multiple Interactions are combined to form a Choreography, which can then be used in different business contexts. In some Choreographies there may be a requirement that, when the Interaction is performed, the Roles in the Choreography have agreement on the outcome. In WS-CDL an alignment Interaction MUST be explicitly used, in the cases where two interacting parties require the alignment of their observable information changes and their exchanged information. After the alignment Interaction completes, both parties progress at the same time, in a lock-step fashion and the Variable information in both parties is aligned. Their Variable alignment comes from the fact that the requesting party has to know that the accepting party has received the message and the other way around, the accepting party has to know that the requesting party has sent the message before both of them progress. There is no intermediate state, where one party sends a message and then it proceeds independently or the other party receives a message and then it proceeds independently. The one-way, request or response messages in an Interaction may also be implemented using a Protocol Based Exchange where a series of messages are exchanged according to some well-known protocol, such as the reliable messaging protocols defined in specifications such as WS-Reliability . In both cases, the same or similar message content may be exchanged as in a simple Interaction, for example the exchanging of an Order between a Buyer and a Seller. Therefore some of the same information changes may result. However when protocols such as the reliable messaging protocols are used, additional information changes will occur. For example, if a Reliable Messaging protocol were being used then the Buyer, once confirmation of delivery of the message was received, would also know that the Seller, s "Order State" Variable was in the state "Received" even though there was no separate Interaction that described this. The Channel through which an Interaction occurs is used to determine whether to enlist the Interaction with an already initiated Choreography or to initiate a new Choreography. Within a Choreography, two or more related Interactions MAY be grouped to form a logical conversation. The Channel through which an Interaction occurs is used to determine whether to enlist the Interaction with an already initiated conversation or to initiate a new conversation. An Interaction completes normally when the request and the response (if there is one) complete successfully. In this case the business documents and Channels exchanged during the request and the response (if there is one) result in the exchanged Variable information being aligned between the two parties. The channelVariable attribute specifies the Channel Variable containing information of a party, being the target of the Interaction, which is used for determining where and how to send and receive information to and into the party. The Channel Variable used in an Interaction MUST be available at the two Roles before the Interaction occurs. In practice, when a Choreography is performed, several different ways of doing correlation may be employed which vary depending on the Channel Type. The operation attribute specifies a one-way or a request-response operation. The specified operation belongs to the interface, as identified by the role and behavior elements of the Channel Type of the Channel Variable used in the Interaction activity. The optional time-to-complete attribute identifies the timeframe within which an Interaction MUST complete. The optional align attribute when set to "true" means that the Interaction results in the common understanding of both the information exchanged and the resulting observable information creations or changes at the ends of the Interaction as specified in the fromRole and the toRole. The default for this attribute is "false". An Interaction activity can be marked as a Choreography initiator when the optional initiate attribute is set to "true". The default for this attribute is "false". Within the participate element, the relationship attribute specifies the Relationship Type this Interaction participates in and the fromRole and toRole attributes specify the requesting and the accepting Role Types respectively. The Role Type identified by the toRole attribute MUST be the same as the Role Type identified by the role element of the Channel Type of the Channel Variable used in the interaction activity. The optional exchange element allows information to be exchanged during a one-way request or a request/response Interaction. Within the exchange element, the optional informationType and channelType attributes, identify the Information Type or the Channel Type of the information that is exchanged between the two Roles in an Interaction. The Variable specified within the receive element MUST not be defined with the attribute silentAction set to "true"
Within the record element, the when attribute specifies if a recording happens "before" or "after" a send or a receive of a message at a Role in a Request or Response exchange. The target Variable MUST not be defined with the attribute silentAction set to "true"
The example below shows a complete Choreography that involves one Interaction. The Interaction happens from Role Type "Consumer" to Role Type "Retailer" on the Channel "retailer-channel" as a request/response message exchange. You could then create a new "Quote and Order" Choreography by reusing the two where the RFQ Choreography was performed first, and then, depending on the outcome of the RFQ Choreography, the order was placed using the Order Placement Choreography. In this case the new Choreography is "composed" out of the two previously defined Choreographies. Using this approach, Choreographies can be recursively combined to support Choreographies of any required complexity allowing more flexibility as Choreographies defined elsewhere can be reused. The perform activity enables a Choreography to specify that another Choreography is performed at this point in its definition, as an enclosed Choreography. Within the perform element the choreographyName attribute references a Locally or Globally defined Choreography to be performed. The performed Choreography even when defined in a different Choreography Package is conceptually treated as an enclosed Choreography. An enclosing Choreography MAY perform only an immediately contained Choreography that is Locally defined. The optional bind element within the perform element enables information in the performing Choreography to be shared with the performed Choreography and vice versa. The role attribute aliases the Roles from the performing Choreography to the performed Choreography. The variable attribute within this element specifies that a Variable in the performing Choreography is bound with the Variable identified by variable attribute within the free element in the performed Choreography. The Assign activity is used to create or change and then make available within one Role, the value of one Variable using the value of another Variable. The assign construct creates or changes at a Role the Variable defined by the target element using the Variable defined by the source element at the same Role. Silent actions are explicit designators used for marking the points where party specific operations with non-observable operational details MAY be performed. For example, the mechanism for checking the inventory of a warehouse should not be observable to other parties but the fact that the inventory level does influence the global observable behavior with a buyer party needs to be specified in the Choreography definition. The optional attribute role is used to specify the party at which the silent action will be performed. If a silent action is defined without a Role, it is implied that the action is performed at all the Roles that are part of the Relationships of the Choreography this activity is enclosed within. No actions are explicit designators used for marking the points where a party does not perform any action. The optional attribute role is used to specify the party at which no action will be performed. If a noAction is defined without a Role, it is implied that no action will be performed at any of the Roles that are part of the Relationships of the Choreography this activity is enclosed within. Because messages can have consequences in the real world, the collaboration parties will impose security requirements on the message exchanges. Many of these requirements can be satisfied by the use of WS-Security . The WS-Reliability specification  provides a reliable mechanism to exchange business documents among collaborating parties. The WS-Reliability specification prescribes the formats for all messages exchanged without placing any restrictions on the content of the encapsulated business documents. The WS-Reliability specification supports one-way and request/response message exchange patterns, over various transport protocols (examples are HTTP/S, FTP, SMTP, etc.). The WS-Reliability specification supports sequencing of messages and guaranteed, exactly once delivery. A violation of any of these consistency guarantees results in an error condition, reflected in the Choreography as an Interaction fault. In WS-CDL, two parties make progress by interacting. In the cases where two interacting parties require the alignment of their Variables capturing observable information changes or their exchanged information between them, an alignment Interaction is modeled in a Choreography. After the alignment Interaction completes, both parties progress at the same time, in a lock-step fashion. The Variable information alignment comes from the fact that the requesting party has to know that the accepting party has received the message and the other way around, the accepting party has to know that the requesting party has sent the message before both of them progress. There is no intermediate state, where one party sends a message and then it proceeds independently or the other party receives a message and then it proceeds independently. Implementing this type of handshaking in a distributed system requires support from a Transaction/Coordination protocol, where agreement of the outcome among parties can be reached even in the case of failures and loss of messages. T. Berners-Lee, R. Fielding, L. Masinter, "Uniform Resource Identifiers (URI): Generic Syntax", RFC 2396, MIT/LCS, U.C. Irvine, Xerox Corporation, August 1998. Web Services Definition Language (WSDL) 2.0 "http://www.w3.org/TR/2004/WD-wsdl20-20040803/"
 Industry Initiative "Universal Description, Discovery and Integration"
 W3C Recommendation "The XML Specification"
 XML-Namespaces " Namespaces in XML, Tim Bray et al., eds., W3C, January 1999"
 W3C Working Draft "XML Schema Part 1: Structures". This is work in progress. W3C Working Draft "XML Schema Part 2: Datatypes". This is work in progress. W3C Recommendation "XML Path Language (XPath) Version 1.0"
 "Uniform Resource Identifiers (URI): Generic Syntax, " RFC 2396, T. Berners-Lee, R. Fielding, L. Masinter, MIT/LCS, U.C. Irvine, Xerox Corporation, August 1998. OASIS Working Draft "BPEL: Business Process Execution Language 2.0". This is work in progress. BPMI.org "BPML: Business Process Modeling Language 1.0"
 OASIS Working Draft "WS-CAF: Web Services Context, Coordination and Transaction Framework 1.0". This is work in progress. OASIS Working Draft "Web Services Reliability 1.0". This is work in progress. elements and attributes from other namespaces to be added. is applied to all CDL constructs. There are several functions that the WS-CDL specification supplies as XPATH 1.0 extension functions. These functions can be used in any XPath expression as long as the types are compatible. Returns the current time at the Role specified by roleName. Returns the current date at the Role specified by roleName. Returns the current date and time at the Role specified by roleName. xsd:boolean hasTimeElapsed(xsd:duration elapsedTime, xsd:QName roleName). Returns "true" if used in a guard or repetition condition of a Work Unit with the block attribute set to "true" and the time specified by elapsedTime at the Role specified by roleName has elapsed from the time the either the guard or the repetition condition were enabled for matching. Otherwise it returns "false". Returns a new globally unique string value for use as an identifier. Returns the information of the Variable with name varName as a node set containing a single node. The second parameter is optional. When the second parameter is not used, this function retrieves from the Variable information the entire document. When the second parameter is used, this function retrieves from the Variable information, the fragment of the document at the provided absolute location path. The third parameter is optional. When the third parameter is used that the Variable information MUST be available at the Role specified by roleName. If this parameter is not used then the Role is inferred from the context that this function is used. Returns "true" if the information of the Variable with name varName is available at the Role specified by roleName. Returns "false" otherwise. Returns "true" if within a Relationship specified by relationshipName the Variable with name varName residing at the first Role of the Relationship has aligned its information with the Variable named withVarName residing at the second Role of the Relationship. Returns the reference information of the Variable with name varName. The Variable MUST be of Channel Type. Returns the identity information of the Variable with name varName. The Variable MUST be of Channel Type. Combines expressions that include Variables that are defined at different Roles.